Innocon's Tactical UAV family. Featuring an innovative aerodynamic structure, the MiniFalcon has a superior weight to payload ratio that enables superior UAV performance. The TUAV can carry half its original unloaded weight as payload. <?xml:namespace prefix = o ns = "urn:schemas-microsoft-com:office:office" /> The unique aerodynamic shape minimizes fuel consumption and increases flight durations which translates into a technological solution enabling large platform performance in a small size air frame. 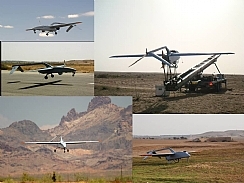 Innocon TUAV is implemented with Automatic Takeoff and Landing for both runway and harsh terrain, using skids for platform survivability on unprepared area or wheels for runway landing.